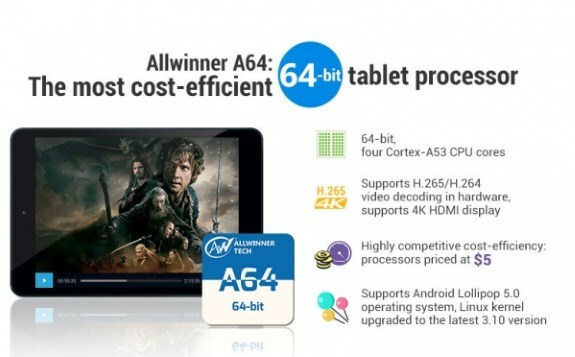 Chinese chip designer Allwinner introduces the A64, a new 64-bit quad-core Cortex-A53 based SoC that promises to be capable of playing 4K video. At least on paper, this $5 chip looks like a pretty good option for low-budget Android tablets. The chip was designed with Android 5.0 in mind, it supports various DDR memory types to save cost and also supports eMMC 5.0 for improved I/O performance and higher data transfer speeds. The exact specifications are still a bit of mystery though and Allwinner doesn't reveal any details about the GPU part of the chip. The GPU remains a mystery, since Allwinner did not disclose the vendor, let alone the any specific information. In the past Allwinner used ARM Mali-T400MP2 and PowerVR SGX544MP2 GPUs on its most prolific Allwinner 3x series SoCs. However, the company made it clear that the Allwinner A64 supports features a GPU with hardware H.265/H.264 video decoding, and support for HDMI 4K displays.